Harness the strength of your distributed team to provide geo-enabled data you can trust. With the Trimble® Juno® 3 series, your mobile workforce is empowered with a fully integrated, GPS-based data collection system for everyday field work. If your organization is managing critical assets, responding to emergencies or keeping an enterprise GIS current, you can increase efficiency—both in the field and in the office with dedicated asset management workflows and Juno 3 series handhelds. Delivered in a compact package resistant to dust, water, and shock, the Juno 3 provides a complete, integrated package of positioning, imaging and communications for total flexibility day after day. 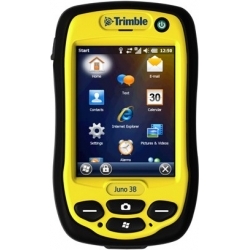 The Trimble Juno 3 series is a compact integrated solution for your field workers, that will keep them connected and in touch. As part of the Trimble family of GPS solutions, Juno 3 series handhelds are fully compatible with Trimble's entirerange of Mapping & GIS software, giving you a choice of GIS data collection and maintenance software solutions at a range of price points. You can easily deploy Juno 3 series handhelds alongside your current Trimble equipment and maintain the same workflows and policies.